Someone broke into my parents house in Jakarta Friday morning. I woke up to find my Mom shouting something to my dad. I thought they were fighting. The more I heard the more I realized she was talking about someone standing IN our house. Then our chauffeur came and said something too. I don’t remember how and whom I asked, I got the answer that someone broke into our house. My mom saw him standing in front of our kitchen door. I was still sleeping. Luckily my chauffeur came in and saved us. He asked the guy, who he was and who he was looking for. The guy told him he was a friend of Slank (a very famous band living right accross my parents house). My chauffeur then brought him to Slank’s house and I heard he kinda vandalized the frontyard. Then the police came and cuffed him. Terrible, but we were very lucky. It was right the morning before we left to the airport for Canada. Enough on the bad news, my parents were here for two days only. We had one day to go out. It was fun. I got a new shirt from Banana Republic for 30% off. 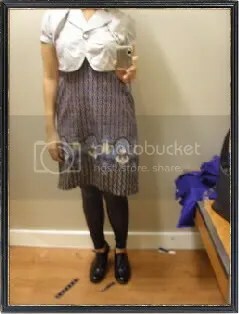 Took picture of my outfit in the fitting room. It was small so I had to exclude my head. That blue shirt on the wooden bench is my new shirt. Nice color, eh? And here’s the family portrait.